As most of you know Maxilead Metals has a real passion for horse racing and has a number of thoroughbreds. 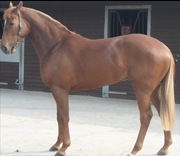 He is a 2 year old chestnut colt called Red Duke. Out of Saudia and by Hard Spun a very good horse in the USA who ran in the Kentucky Derby. He is set to make his debut at the end of the month. Keep an eye out as he is a very exciting prospect.